There Was No Switch Between the Democrat Party & the Republican Party in the 1960s. In 1964 the Democrats controlled both the House and the Senate, along with a Democrat President. What is shocking is there was a debate, wait if the Democrats were for the Black man! Why was there any debate? Why wouldn’t these Civil Rights Activist Democrats just pass the legislation through both houses, without any Republican Support? Nonetheless as your notice below with the voting patterns that was far from the truth. 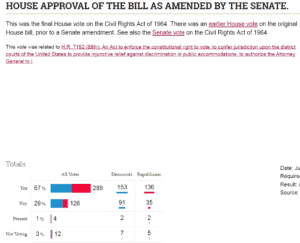 It’s simple, the Democrats didn’t want the Civil Rights Act, in fact they had to be bargained into voting for the bill and if you notice in the break down above, almost as many Democrat Senators voted against the bill as Republican Senators who voted for the bill. An unfortunately almost the same trend remains true with the House of Representatives. 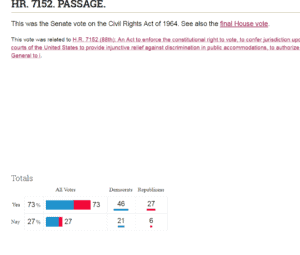 Yes, your eyes are not deceiving you 91 Democrat members of the House voted against the Civil Rights Act of 1964. Making that a Grand total of 112 Democrat Members of Congress voting against the bill, compared with only 41 total Republican Members of the of Congress voting against. The unfortunate part is all the liberal left leaning persons who read this will ignore the facts, because their history books (also written by liberals) has frame the narrative as the Democrats being the champion of the Black Man and Civil Rights. When in Reality that was far from the truth. Our Black Politicians & Black Leaders Have Failed Us!